Reading the characters from a standard punch-tape, and converting the code of each punched character into the corresponding Hell-pixel sequence. This is done with a device called a tape-transmitter (tape sender, "Lochstreifensender"). 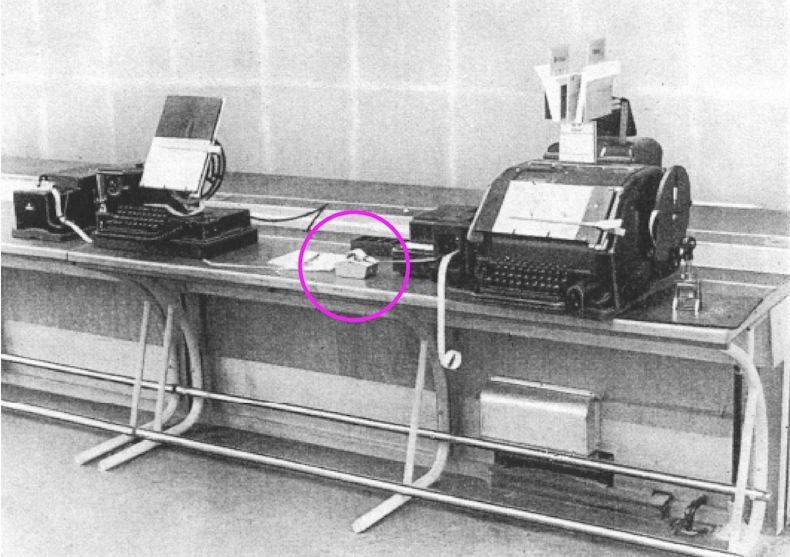 The punched paper tape is produced with a keyboard-perforator ("Handlocher", "Tastenlocher"). The standard 5-bit International Telegraph Alphabet No. 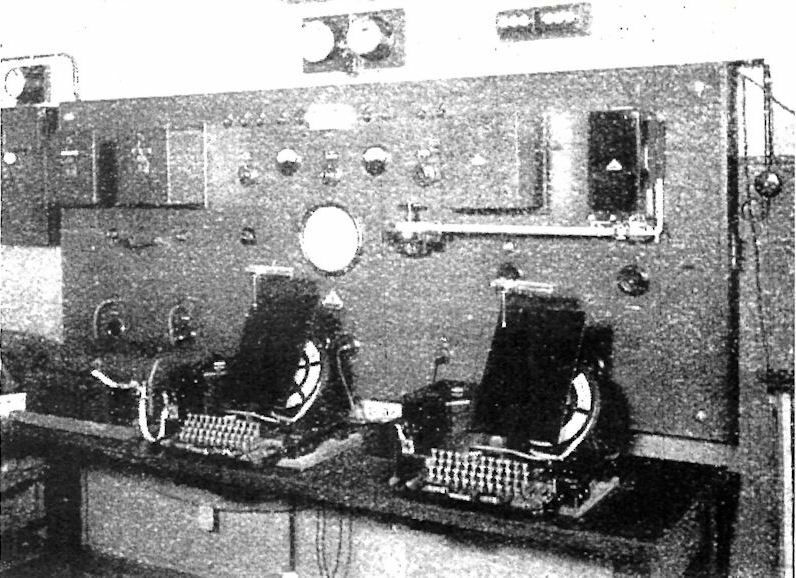 2 ( ITA-2, CCITT-2) was used, as adopted at the 1932 Madrid conference of the International Telecommunication Union (ITU/CCITT). 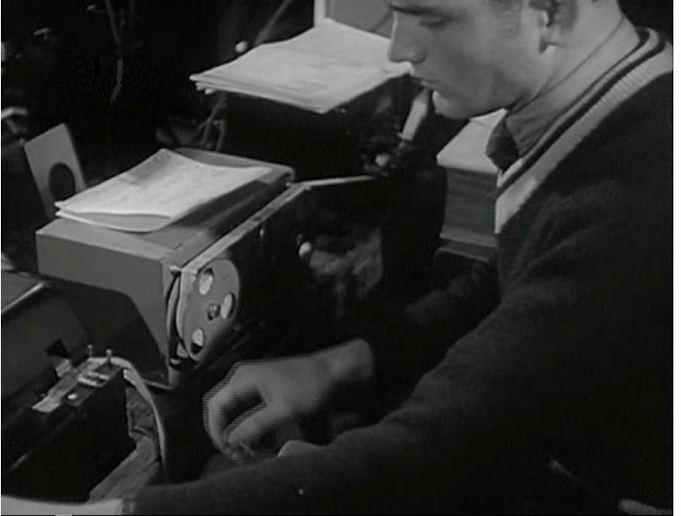 Typing the characters directly on a keyboard that is connected to the spinning Hell-character drum. This is done with a keyboard-sender ("Handgeber"). Both the punch-tape Hell-sender and the keyboard Hell-sender generate a sequence of closing and opening of an electrical contact. This stream of switch-actuations is converted into a stream of on/off tone pulses with a tone generator. The resulting tone pulses are then broadcast to subscribers with an AM-transmitter. Hence, a regular AM-radio can be be used to receive those tone pulses - no need for a special telegraphy receiver with a BFO. Note that Hell tone-pulses could also be sent via phone lines, wired-radio lines ("Drahtfunk"), high-voltage power lines, and with a CW-transmitter. The received tone-pulses at the loudspeaker output of the radio are passed to a keying-amplifier ("Tastverstärker", "Tastgerät", "Schreibverstärker"). This amplifier converts the tone-pulses back into on/off DC-pulses ( = detection), that are amplified to have enough power (at least 2 watt) to energize the printer-solenoid of the Presse-Hell printer. 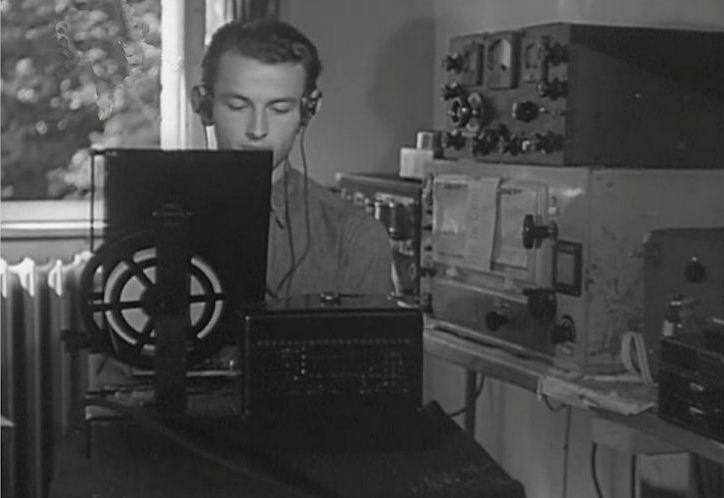 Some special Hell radio receivers have a built-in detector/amplifier and do not need an external keying-amplifier. 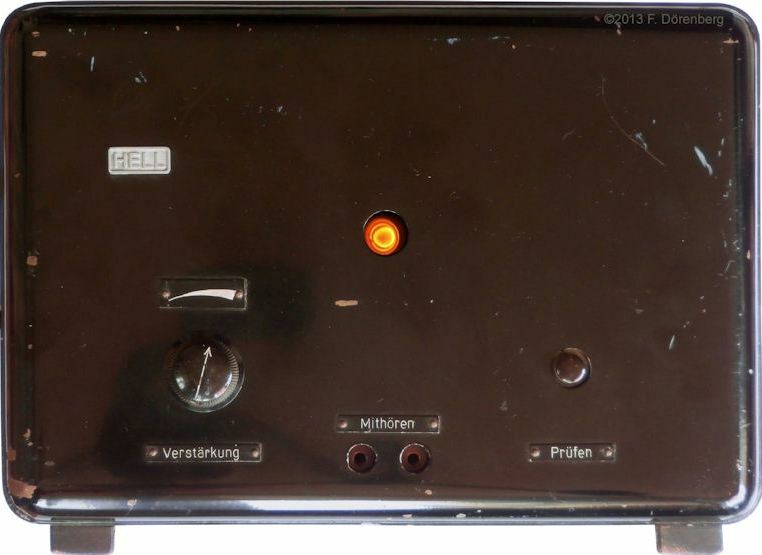 Radio receivers used with Siemens-Hell "Presse Hell" printers are discussed on this page. Original 1937-1952 prices of Hellschreiber equipment are presented on this page. 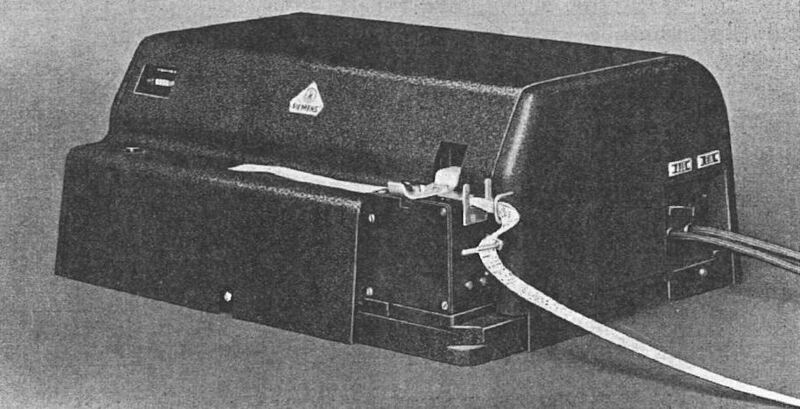 PUNCH-TAPE PERFORATORS - "HANDLOCHER / TASTENLOCHER"
As outlined above, one way to generate a text string in Hell-format, is to create a punch-tape and feed the tape to a Hell tape-sender. 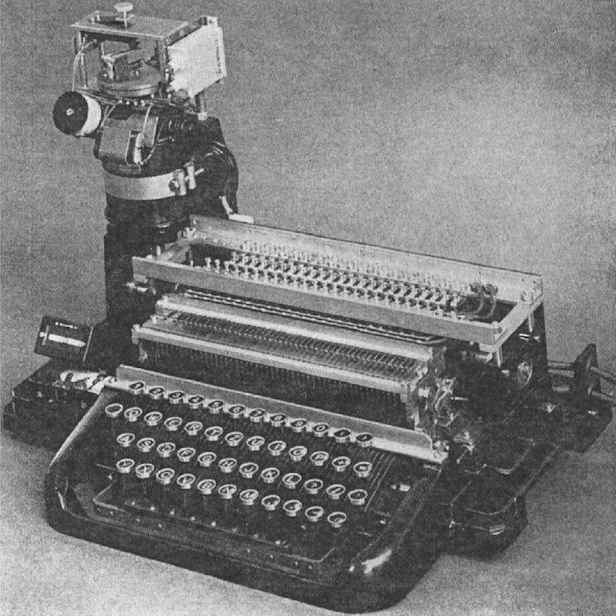 Punching the tape is done with a keyboard-perforator ("Handlocher", "Tastenlocher"). This is not specific to the Hell system: perforators are generally used with all teleprinter systems. 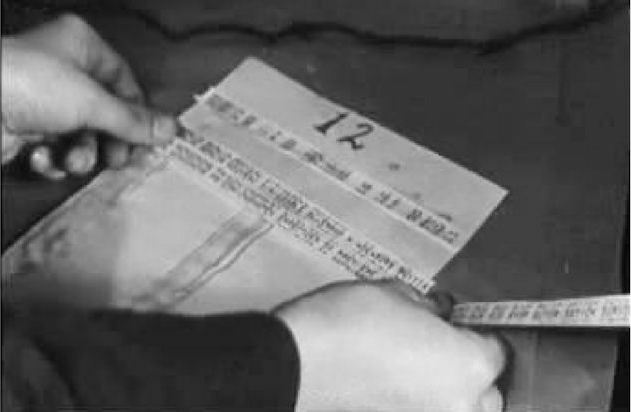 Using punch tape makes it possible to send messages at a speed that is significantly higher than that of manual typing. One disadvantage of the tape-senders is that no record of the generated message is created. Fig. 4: Siemens-Halske "T loch 1k"
Fig. 5: the rear of the "T loch 1k"
Fig. 6: motor, gearing, and character counter of the "T loch 1k"
Fig. 7: motor and gearing of the "T loch 1k"
During the early 1950s, model T.loch.1 was replaced by model T.loch.12a (ref. 4). 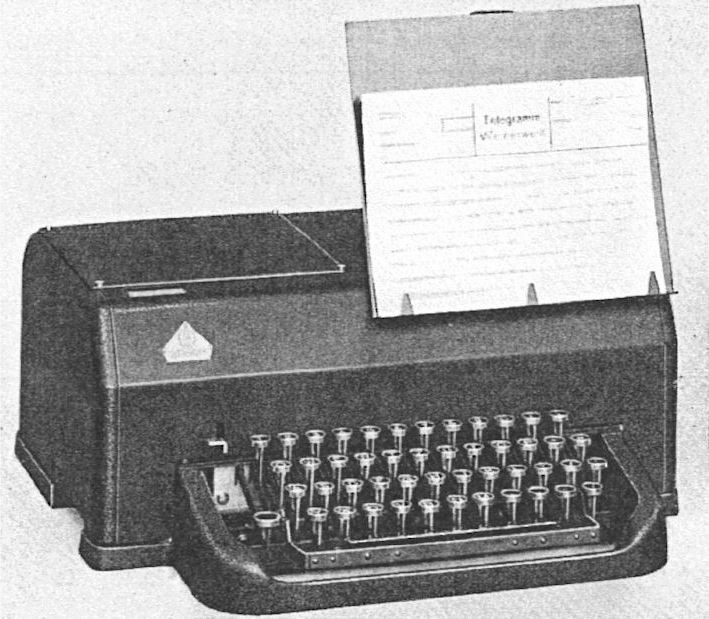 The new design was based on the keyboard of the Siemens-Halske teleprinter T typ 37. It can process up to 15 char/sec. The unit measures 40x30x18 cm (WxDxH, ≈1612x7 inch), and weighs 13 kg (≈ 35 lbs). 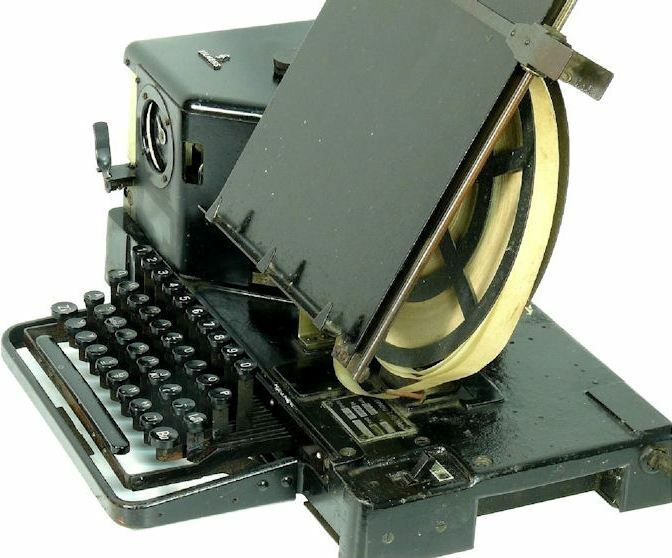 There is a version that is intended for use with a page-teleprinter. Like the T.loch.1k above, it has a counter (item nr. 2 in the right-hand photo below) for 69 characters per line. It sounds a warning 10 characters before the end of a text line is reached. The label above indicates "2H" as the year of manufacture ("Baujahr"). This is month 2 of year "H". Siemens-Halske started a new numbering scheme when it resumed operation after WWII: "A" stands for 1945, "B" for 1946, etc. So, this particular unit was built in February of 1952. SIEMENS-HELL TAPE SENDER/TRANSMITTER - "LOCHSTREIFENSENDER / LOCHSTREIFENGEBER"
Once a tape has been punched with the text message to be transmitted, a Hell tape-sender reads the tape and converts each coded character from the tape into the pulse sequence of the corresponding Hell-character. This requires a tape-reader that drives a number of selector-bars. 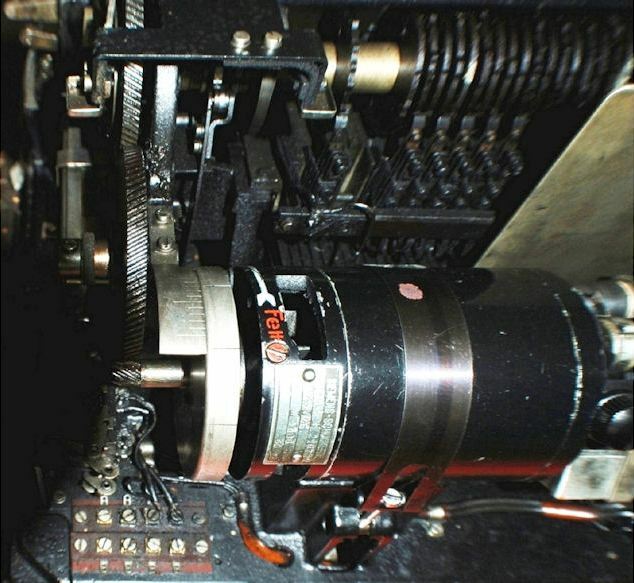 The selector-bars are used to select a track of the spinning character-drum (cam shaft, stack of notched disks), and engage a contact when the drum passes through its starting position. In one revolution of the drum, the contact closes and opens a number of times, according to the pixel pattern of the particular Hell-character. At the end of the sequence, the contact disengages. The drum-contacts of all characters are connected in parallel, and form the output of the sender. 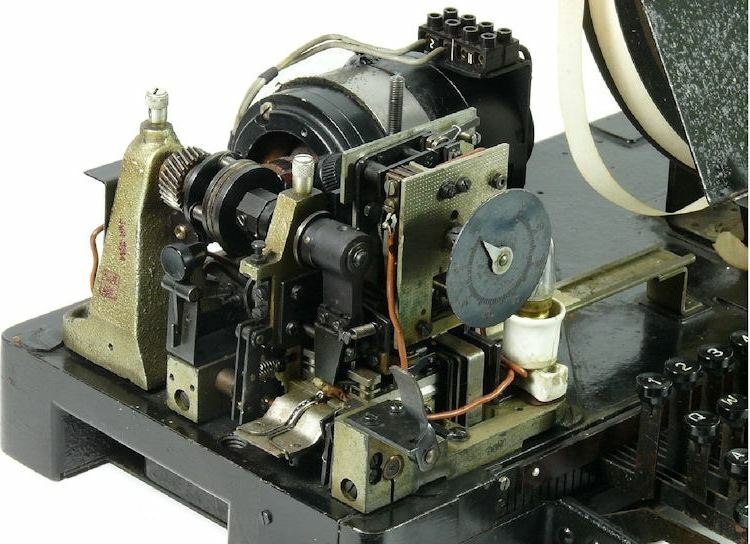 The tape-senders transmit at a speed of 5 or 5.5 characters/sec (300 or 330 chars/min). 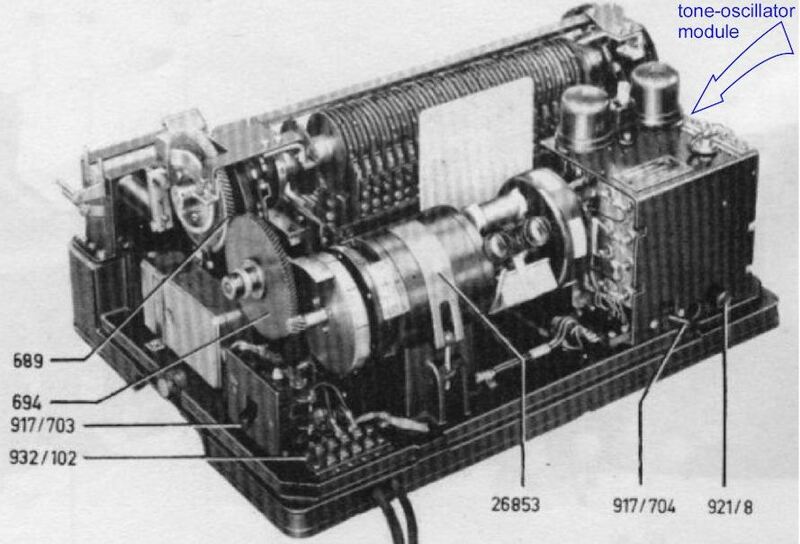 The first Siemens-Hell-Lochstreifensender is model T.send.17c. I am not aware of the existence of models 17a and 17b. The unit measures 44x34x19 cm (WxDxH, 17.3x13.4x7.5 inch) and weighs 20 kg (44 lbs), ref. 2. Fig. 12. Siemens-Hell-Lochstreifengeber "T send 17c"
Fig. 13. Siemens-Hell-Lochstreifengeber "T send 17c"
Fig. 17: Siemens-Hell "T send 17c" fed by a Siemens teleprinter "Blattschreiber mit angebautem Empfangslocher"
Model T send 62a (a.k.a. model "S") is the successor to model T.send.17c. It was made more compact by placing the contacts of the character-drum on both sides of the drum. Also, while one character is being transmitted, the next character is already being scanned from the punch tape. The design is modular, making maintenance and replacement easier and faster. Ref. 13. The unit has buttons for remote control of a T.empf.12 or T.empf.14 printer. There is also push button on the front of the punch tape reader to send the Hell pause-character (like the Feld-Hell). Ref. 12, 13. One version of the T.send.62 has a built-in tone oscillator. Push-button for sending a start- or stop-signal to the connected T empf 12 or T empf 14 "Presse-Hell" printer; the button has to be pushed for about 1 sec to signal "start", and 7-10 sec for "stop". Push-button for sending the Hell pause-character. 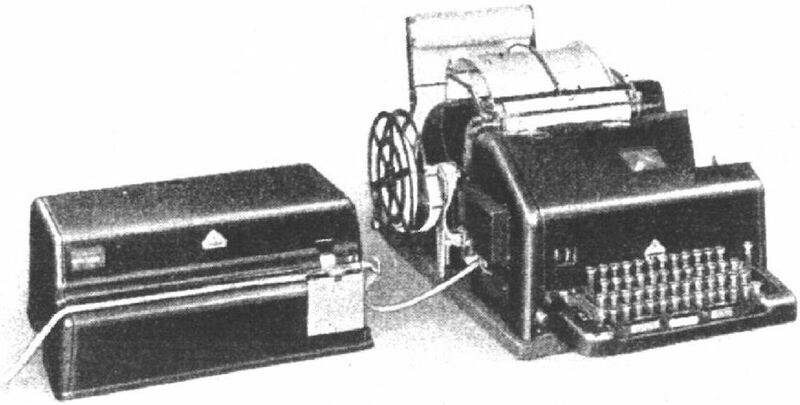 Option: tape reader-head for chadless punch-tape ("Schuppenlochstreifen"). A "chad" is the small round piece of paper that is created when a hole is punched into the punch tape. A chad can remain attached to the hole and interfere with reading the tape, or interfere with the electromechanical parts of the equipment. 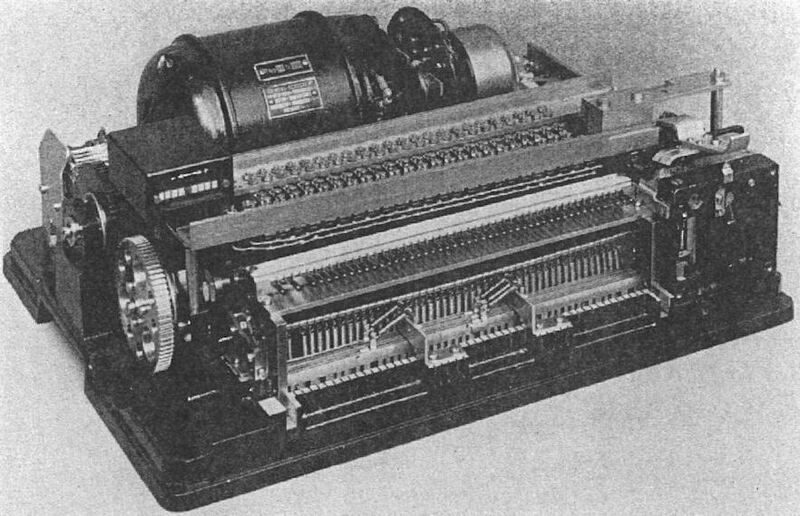 SIEMENS-HELL KEYBOARD SENDERS - "HANDGEBER / HANDSENDER"
As opposed to a punch-tape sender, a keyboard-sender ("Handsender") does not read the text to be sent from a punch tape, but the operator enters it manually with the keyboard. Like a Hell tape-sender, it has a character drum (cam shaft, stack of notched disks). 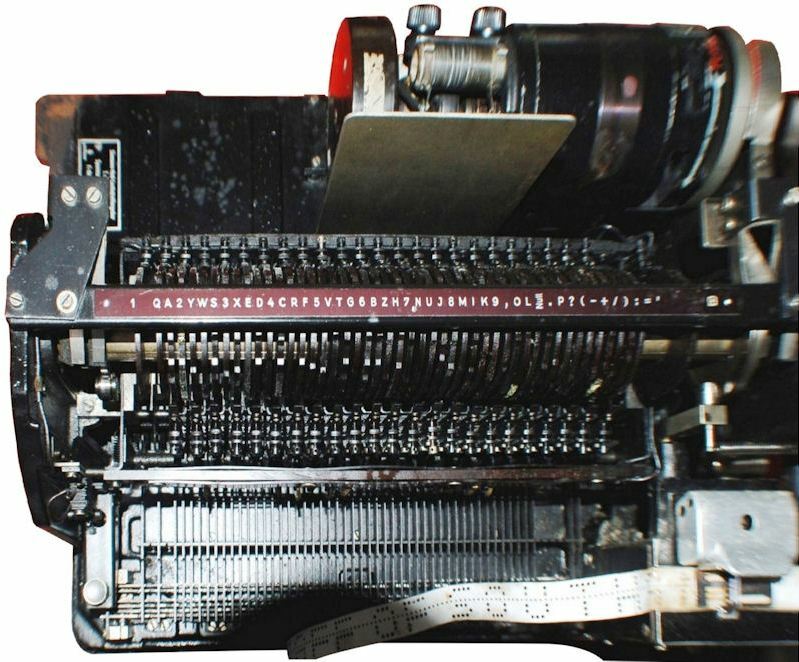 The selector bar mechanism is now between the keyboard and the character drum, rather than between the punch-tape reader and the drum. The drum turns at a constant 150 rpm, equivalent to 2.5 characters per second (150 chars/min). This require a special typing rhythm, as the keys of the keyboard are only enabled briefly, once per revolution of the drum. This is half the speed of the Siemens-Hell tape-senders. Shown below is the ca. 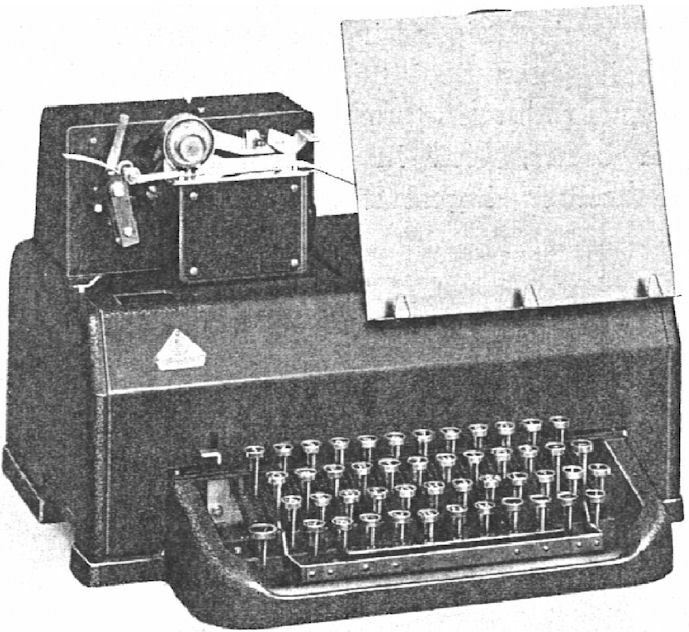 1933 Siemens-Hell keyboard-sender. I do not know the model's name or the "T.send" type designator. The motor with its centrifugal speed regulator is installed vertically. Like the Hell Feldfernschreiber, the (fixed) typing speed is 2.5 characters/sec (150 chars/min), ref. 3. 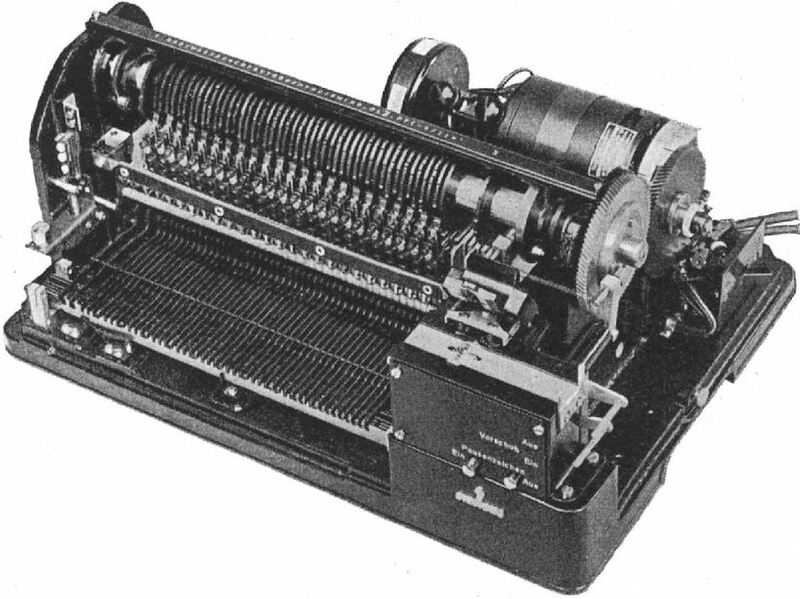 Siemens-Hell-Handsender model T.send.18a is the successor to the model shown above. The unit measures 43x39x34.5 cm (WxDxH, ≈17x15.4x13.6 inch), weighed 18 kg (≈40 lbs), and used about 40 watts of electrical power. Note the rectangular cover plate on top of the unit in the photo above. This is where a printer module could be installed. See photo below. 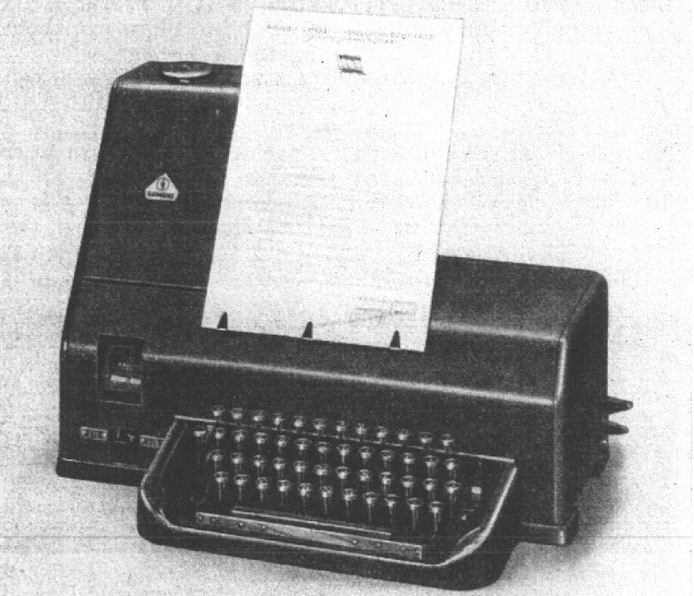 Model version 18b had the attached printer, and was developed for "special purposes" (p.7 in ref. 10). However, as the unit was not battery-powered, it was not suitable for mobile ( = military) operations, and was not widely used. It was succeeded by the Hell Feld-Fernschreiber ("Feld Hell"). 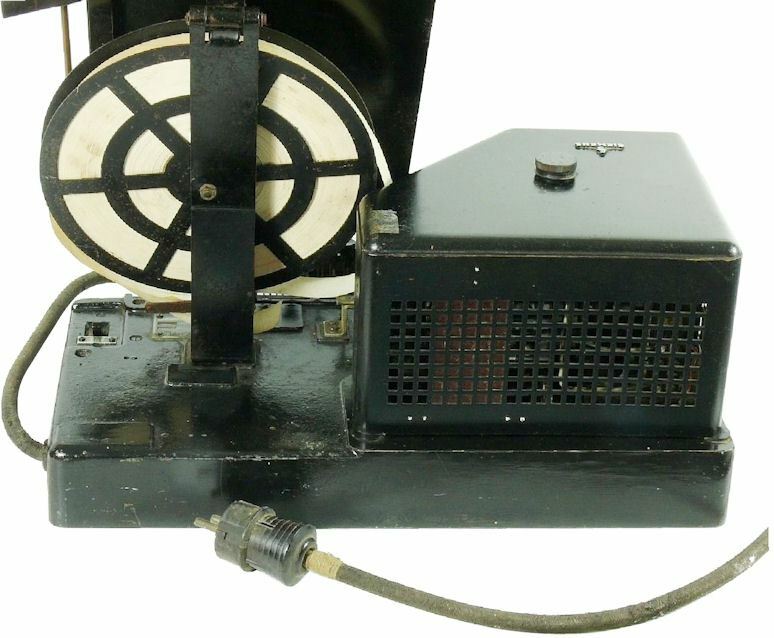 Model version 18b was about 3 kg (≈6.6 lbs) heavier than the 18a, and used 5 watts more power. 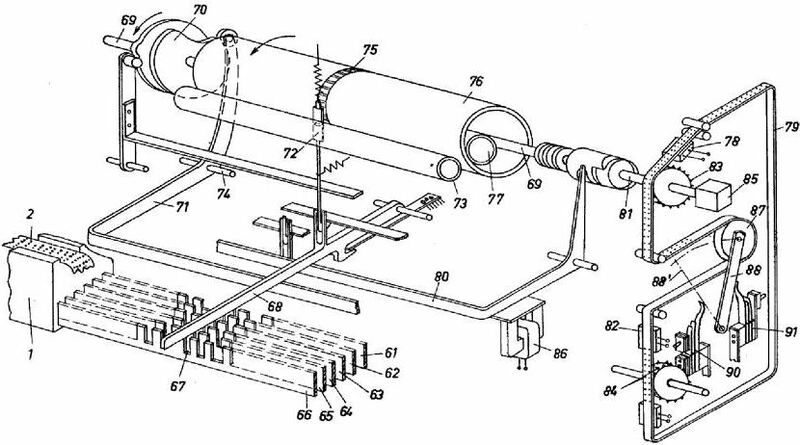 The output signal of the Siemens-Hell punch tape and keyboard senders is basically the closing and opening of an electrical contact, in the rhythm of the Hell-pixels to be sent. These contact pulses must somehow be sent to the subscribing Hell-printers via a radio transmitter. The easiest way to do this, is to convert those contact pulses to audio tone pulses of the same duration. This is done with a tone generator ("Tonsummer" = "tone buzzer", "Rohrsummer" or "Röhrensummer" = "vacuum tube buzzer") that generates a signal with a constant audio tone frequency. The tone signal is turned on/off (= keyed) by putting it in series with the contact open/close pulses from the tape or keyboard sender. The resulting tone pulses are then simply transmitted via an AM radio transmitter, and can be received with any basic radio receiver. The connection between the tone generator and the radio transmitter via standard phone lines. 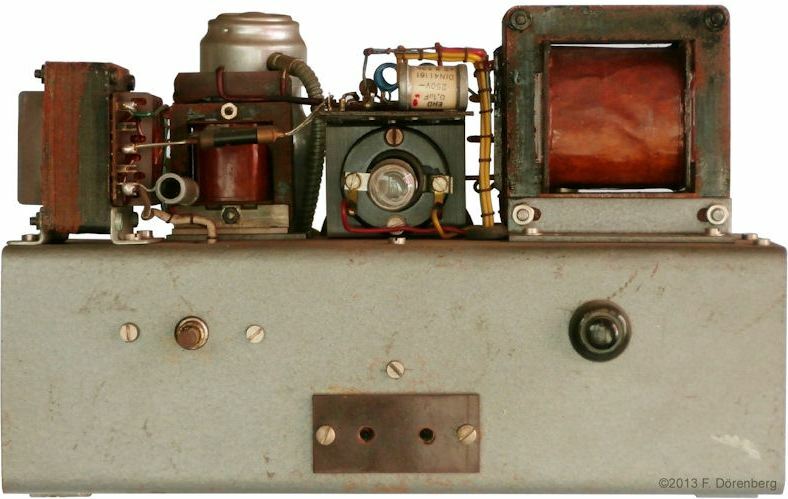 Note that one version of the Siemens-Hell tape sender model T.send.62 had a built-in tone oscillator. Hence, it did not require an external tone generator. 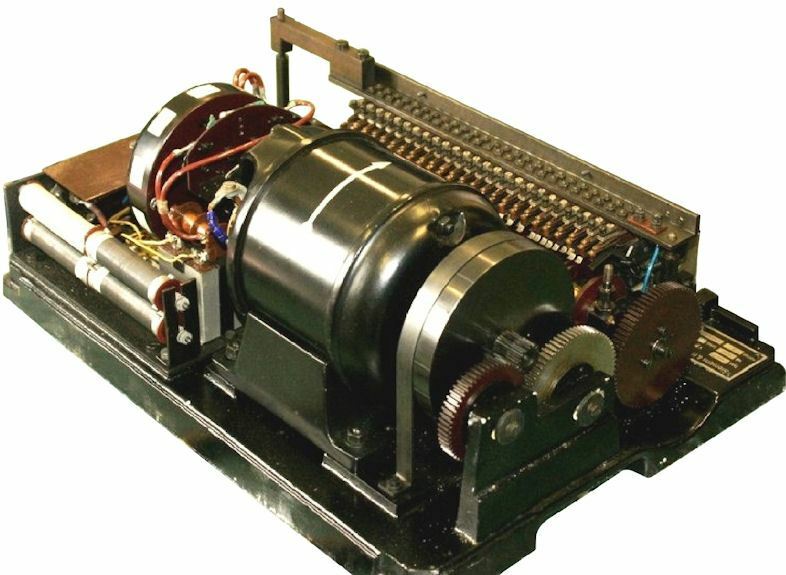 Siemens-Hell Tonsummer model T.sum.3 is the most basic tone generator. It has two pairs of banana jacks for the signal output at two different signal levels: "high" and "low". There is also an output for a headset. with associated volume control. The unit measures 27x24x18 cm (WxDxH, ≈10.6x9.5x7 inch), weighs 6.5 kg (≈14.3 lbs), and consumes 35 watts of electrical power. 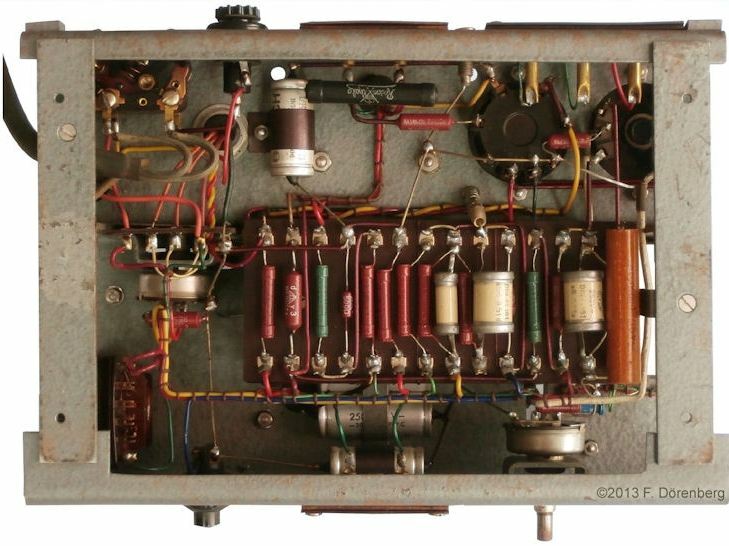 It has two vacuum tubes: an RGN 1064 or 1054 dual-diode rectifier, and an RE 134 power-amplifier triode. I do not know the difference between model 3a and 3b. The Siemens-Hell T.sum.5 is the successor to the model T.sum.3. It used a single vacuum tube of type EDD 11. This is a dual-triode, one triode for the tone oscillator, the other for the output amplifier. The unit weighed 6.5 kg (≈14 lbs). 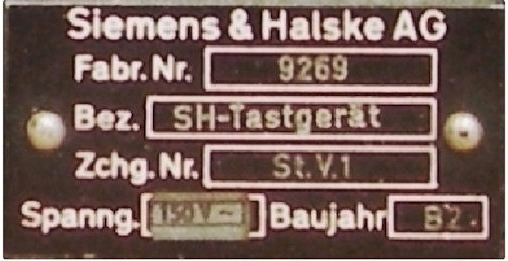 KEYING AMPLIFIERS - "TASTVERSTÄRKER / TASTGERÄT / SCHREIBVERSTÄRKER"
As outlined above, Hell-messages are generated with a Siemens-Hell tape-sender or keyboard-sender. The output of the sender is basically an electrical contact that closes and opens in the rhythm of the pixel sequence of the transmitted characters. The sender's keying contact can actually be used to key the final stage of a nearby small ( = low power) AM radio transmitter on/off. In this case, a constant audio tone must be provided to the audio/microphone input of the transmitter. For a remote or high(er) power transmitter, this is not an option. In this case, as outlined above, a tone generator is placed in series with the output contact of the sender. This converts the actuations of the sender's output contact into tone pulses. These tone pulses can be sent to the audio input of a remote AM radio transmitter (e.g., via regular phone lines). The transmitter is turned "on" for the entire duration of the Hell-message. Both of the above two configurations can be implementing without needing a special keying device ("Tastverstärker", "Tastgerät", "Sendertastgerät") to key the radio transmitter on/off. As stated above, the power rating of the sender's output contact is too low for directly keying a medium or high power radio transmitter. The sender's output contact i splaced in series with a tone genarator and the resuoting tone pulses a passed to the (remote) keying device. Depending on the keying method used in the transmitter, the keying device converts the tone pulses to a high DC voltage of the applicable polarity, or a lower grid-bias voltage. 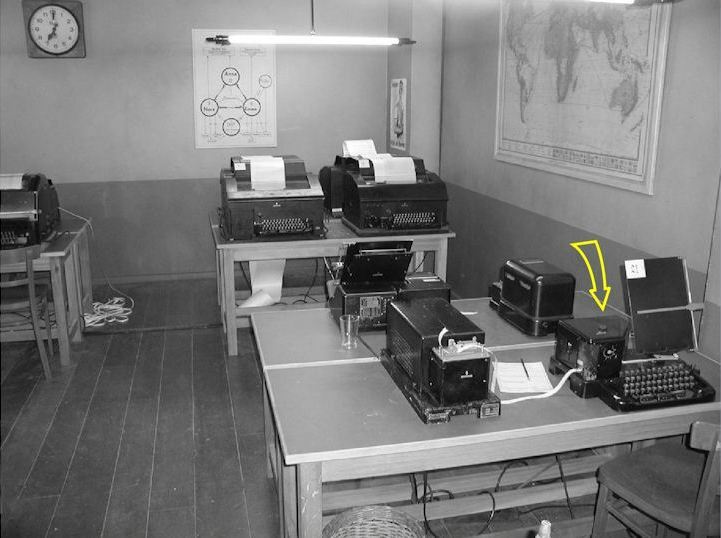 Some WW2 German military transmitters had such a keying device built-in, for high-speed "Morse" telegraphy and Hellschreiber, see this page. The audio output of a regular radio receiver typically is not powerful enough to directly energize the solenoid of a Hellschreiber printer. Furthermore, the Hell-printers built since ca. 1934, use a DC-powered solenoid. This means that a detector-amplifier must be placed between the radio receiver and the Hell-printer. Such a printer keying device ("Schreibverstärker", "Empfangstastgerät") converts the received tone pulses into DC-pulses that have enough power to key a Hell printer solenoid on/off. This requires 10 or 20 mA DC-current at about 40 volt. In addition, the keying device can provide increased selectivity via a bandpass tone-filter, with a center frequency equal to the audio tone frequency of the Hell-pulses. 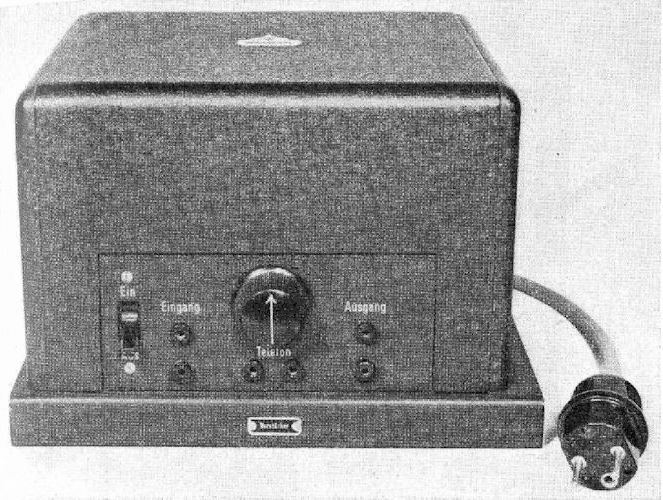 The T.verst.16 was the initial, very simple, printer keying amplifier ("Schreibverstärker") for Presse-Hell printers. It only has an input for tone pulses, gain/volume control, an output for DC-current pulses, and an audio output for a headset. The unit has exactly the same look, size, and weight as the T.sum3 tone generator: 27x24x18 cm (WxDxH, ≈10.6x9.5x7 inch), and 6.5 kg (≈14.3 lbs). It consumed about 45 watts of electrical power. This model was made in at least three versions: 16a, 16b, and 16d (ref. 2). 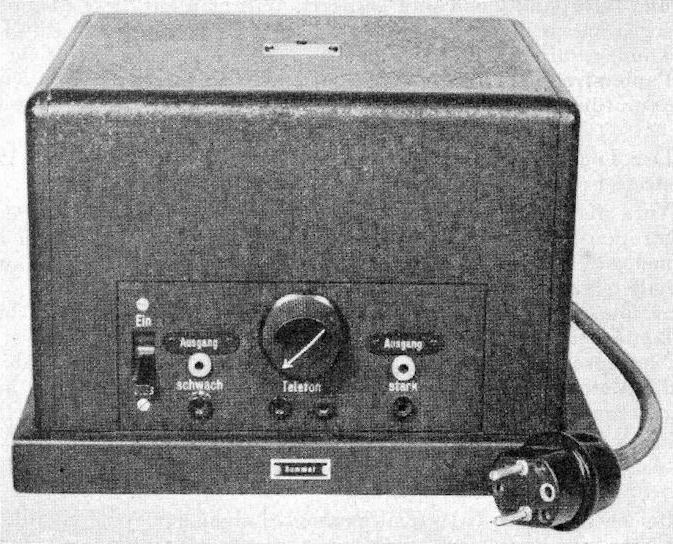 They had the following vacuum tubes: an RGN 1064 or RGN 1054 dual-diode rectifier, an RE 604 triode, and either an RE 904 (model version 16a, 16b) or an RE 924 (version 16d). Fig. 33: keying-amplifier model "T.verst.16a"
Model T.verst.18a was an upgrade of model T.verst.16. It has separate transformer-coupled inputs for 600 ohm (phone line) and 4000 ohm (high-impedance headset/loudspeaker output of a radio). It also includes a bandpass tone filter that is selectable to 900 Hz / Off / 1500 Hz. Again, there is a gain/volume control knob and a headset output. The connectors for all inputs and outputs are pairs of jacks for banana plugs or equivalent two-prong plugs. Oddly, the power cord enters the unit on the front. Fig. 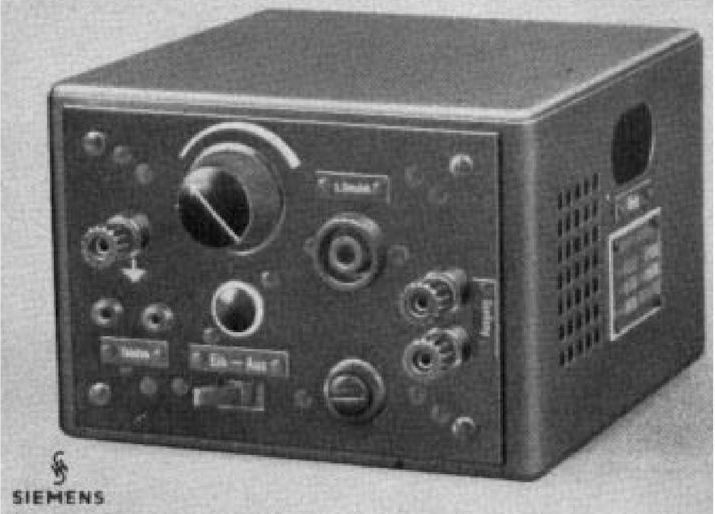 34: keying-amplifier model "T.verst.18a"
The version of the T.verst.18 shown below has a ground lug on the front (below the tone-input jacks) and a so-called Siemens-Schuckert teleprinter "OD" jack for the current output to the printer. The power cord now enters the unit on the rear. Fig. 35: keying-amplifier model "T.verst.18b" - "kleines Sendetastgerät"
The St.V.1 /St.verst.1 comprises a straight forward two-stage detector/amplfier, just like the Feld-Hell machine: a pre-amplifier with manual gain control, followed by a full-wave diode rectifier bridge ( = detector) with a simple smoothing filter, and a DC power-amplifier. Note: ref. 5 erroneously refers to this unit as a tuning-fork tone oscillator ("Stimmgabelsummer"). Per the technical description (ref. 17), it is intended intended for contactless DC-keying of a radio transmitter, and accommodates transmitters that require a high positive or negative keying-voltage, or a grid-control bias voltage (via series resistor). Nominal output current: 20 mA (also the standard current for Presse-Hell printer-solenoids). Miscellaneous: push button on the front of the unit, to activate the output without a tone signal being present at the input. The label above indicates "B2" as the year of manufacture ("Baujahr"). This is month 2 of year "B". Siemens-Halske started a new numbering scheme when it resumed operation after WWII: "A" stands for 1945, "B" for 1946, etc. So, this particular unit was built in February of 1946. Fig. 40: the military version of the Siemens-Halske model "St.V. 1"
According to ref. 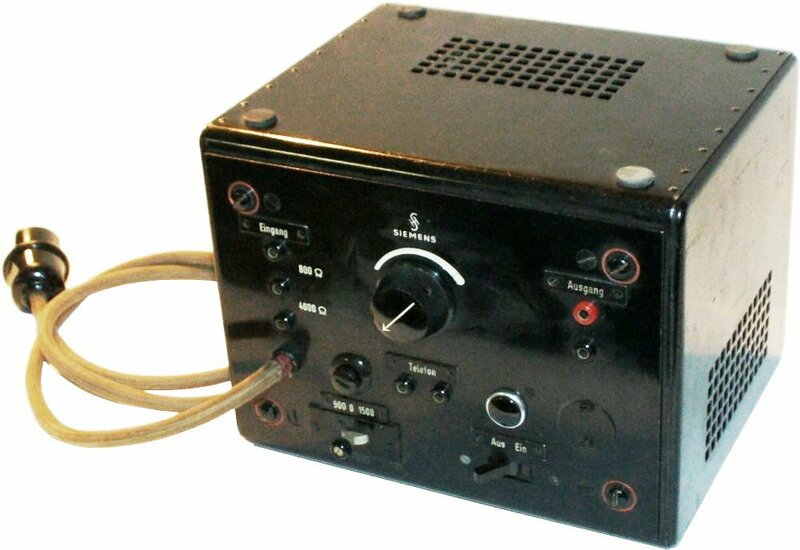 20, Siemens-Halske also built a keying amplifier model T.verst.32. 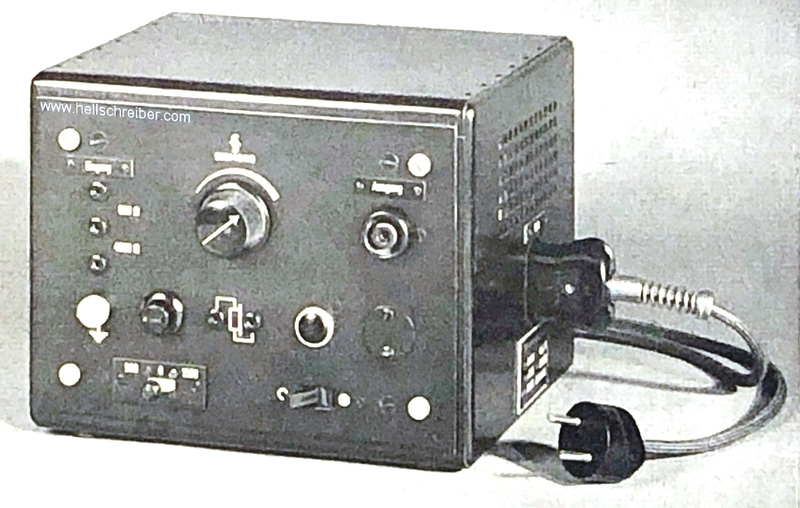 It had two separate standard inputs for 600 ohm (phone line) and 4000 ohm (high-impedance loudspeaker/headset output of a radio receiver), with an input sensitivity of 8 and 20 mV respectively. It was suitable for telegraphy speeds up to 340 Bd. 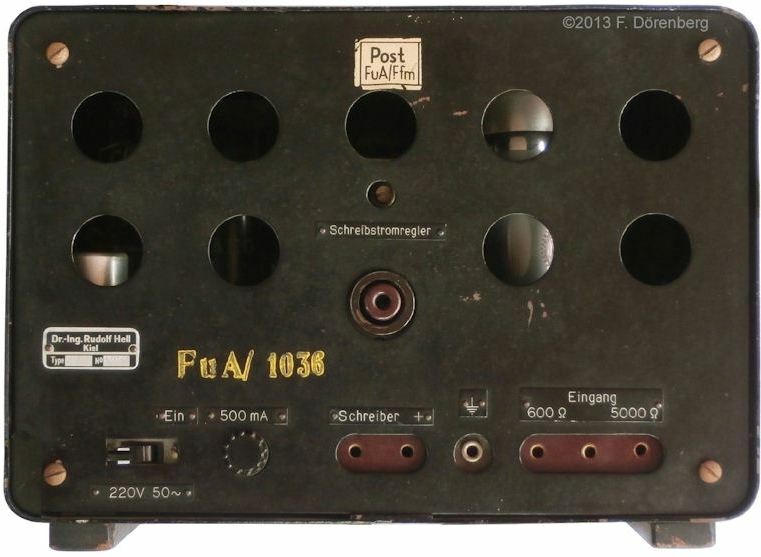 I do not have any other information on this model, nor a photo - unless it is the one shown below, which is only labeled as "large keying device" ("großes Sendetastgerät", ref. 10). 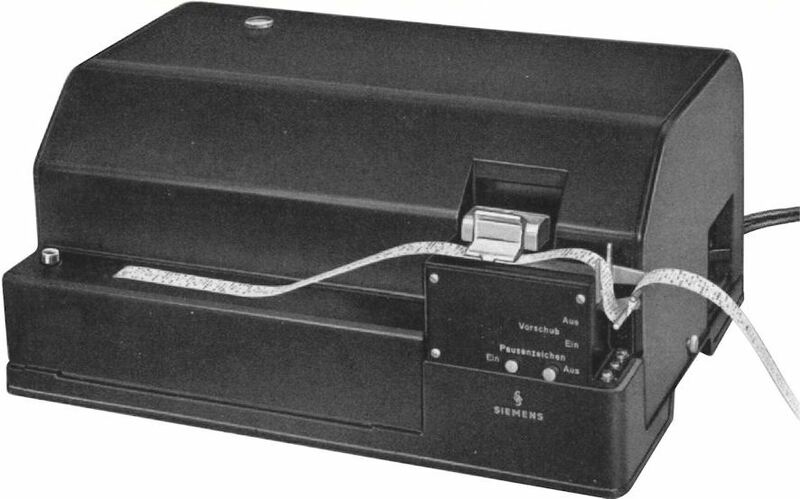 The Hell company also made keying devices for Hellschreiber and high-speed Morse printers, e.g., the Schreibverstärker SV 36, ref. 19. Fig. 42: label on my "SV36"
This model comprises a pre-amplifier with an EF12 pentode, followed by a full-wave diode rectifier bridge (4x Siemens-Halske Sirutor 5b diodes), a standard diode/capacitor voltage-doubler, (again Sirutor 5b diodes), and an EBL1 double-diode pentode final amplifier. The EBL1 has enough current drive capability (36 mA max, 4.5 max anode dissipation) to source 20 mA DC nominal drive current of a Hell-printer. The audio input of the unit is transformer-isolated (i.e., safe to connect to a PC soundcard audio output). The transformer is for 5000 Ω (radio receiver output), with a tap for 600 Ω (phone line). Both inputs are located on the back of the unit. The front of the unit has a neon lamp (directly connected to 220 volt AC), a test button (to activate the final amplifier independent of an audio input signal), and a "Mithören" output. The latter is for monitoring the output of the pre-amplifier with a high-impedance headset, via a separate winding on the isolation transformer between the pre- and final-amplifier. The unit measures 28x22x20 cm (WxDxH, ≈11x9x8 inch), weighs 6.5 kg (≈14 lbs), and is powered by 220 volt AC (30 W). Fig. 43: front of the Hell "SV 36"
The push button marked "Prüfen" ( = test) is for activating the DC-output of the amplifier, without an input signal. Fig. 44: rear of the Hell "SV 36"
Fig. 45: front view of the chassis and circuitry of the Hell "SV 36"
Fig. 46: view of the rear of the chassis and circuitry of the Hell "SV 36"
Fig. 47: top view of the chassis and circuitry of the Hell "SV 36"
Fig. 48: bottom view of the chassis and circuitry of the Hell "SV 36"
Be careful when touching the printer-output connector (or hooking up a scope probe): one side is connected directly to the anode voltage (about 250 volt DC)! Also, there is no suppressor diode across the printer's solenoid or in the amplifier output. So, large inductive voltage spikes (several 100 Volt) appear at the connector upon (de-)energizing the solenoid! Fig. 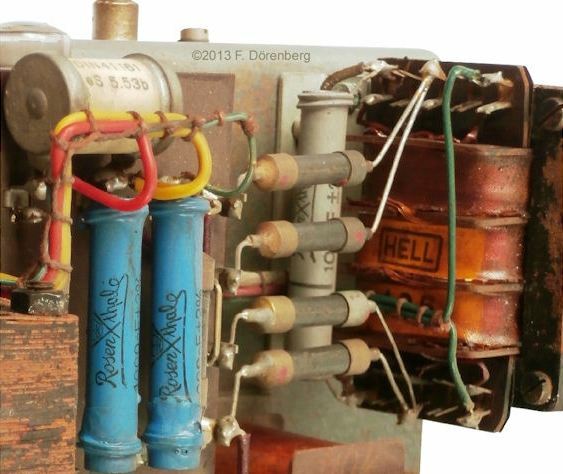 51: Hell transformer, Rosenthal capacitors, and Siemens Sirutor diodes of the "SV 36"
All transformers (1x power, 2x audio) and chokes (2x) are made by the Hell company. The ceramic tube capacitors are made by the world-famous porcelain company Rosenthal in Selb/Oberfranken. In 1900 Mr. Philip Rosenthal, as a sideline to his established business of porcelain tableware, started to manufacture ceramics for electronic applications such as insulators, capacitors (in the "Werk III" factory), and resistors (in "Werk IV"). In 1936, this electronic ceramics activity was separated from Rosenthal AG and made part of a joint venture with AEG named Rosenthal Isolatoren GmbH (RIG). 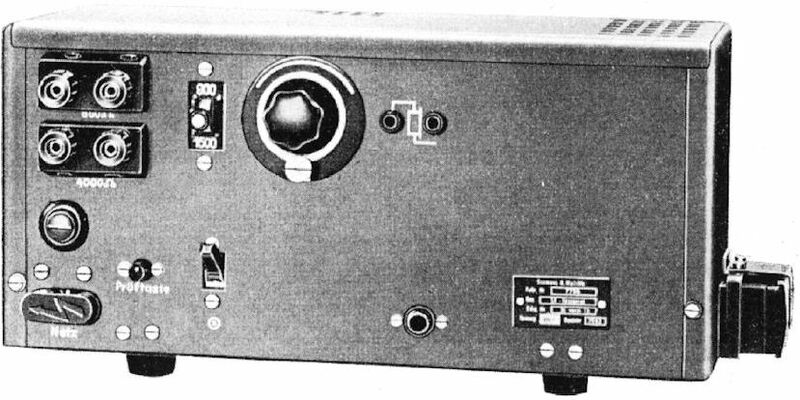 The RIG name lasted until 1974, when AEG took over all of RIG and renamed it "CRL" because of its portfolio of passive components. The name was changed once again in 1974, to Draloric Electronic GmbH. 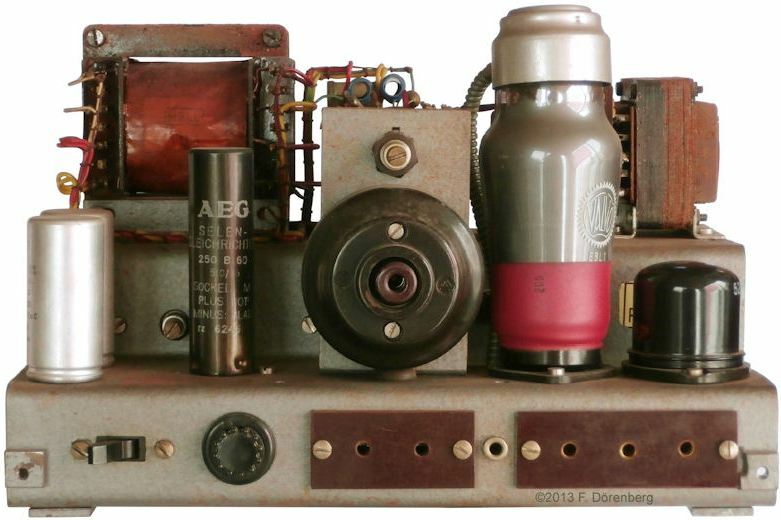 The SV36 unit also has a selenium rectifier ("Selengleichrichter") made by AEG, and electrolytic capacitors made by Süddeutsche Apparate-Fabrik GmbH (SAF) in Nürnberg (Nuremberg); the date code suggest they were manufactured in 1951. SAF was founded in 1930, by Felten und Guilleaume (F&G) and Standard Elektrizitätsgesellschaft in Berlin (SEG, subsidiary of AT&T in the USA and majority shareholder of the C. Lorenz AG company since 1930). 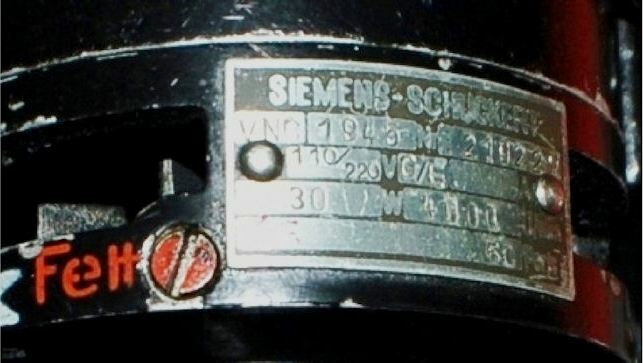 The solid-sate diodes in the 4-diode rectifier bridge are "Siemens Rundfunk Detektor" (SIRUTOR, "Siemens broadcast detector"). They are cuprous-oxide-on-copper diodes ("Kupferoxydul-Pillengleichrichter"). Siemens-Halske started to produce these small-signal detector diodes around 1930. 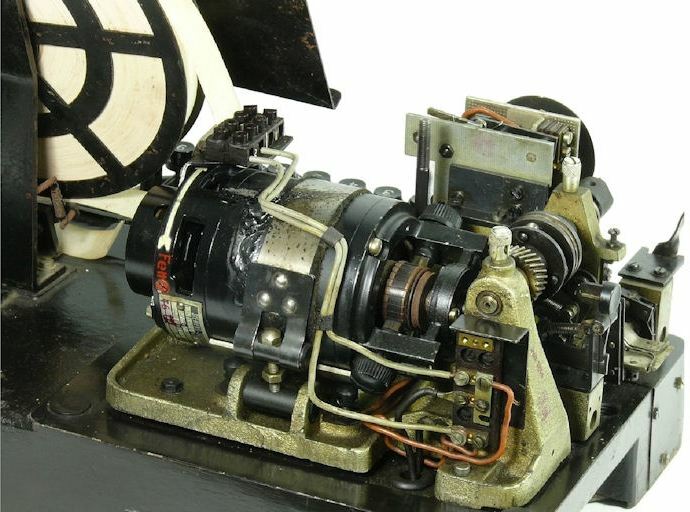 PAPER-TAPE WINDER - "STREIFENZIEHER / AUFWICKELVORRICHTUNG"
By 1937, Siemens-Halske had developed a successor to the above model - the Fm.div.359c. It too was powered by a hand-wound clock-spring. 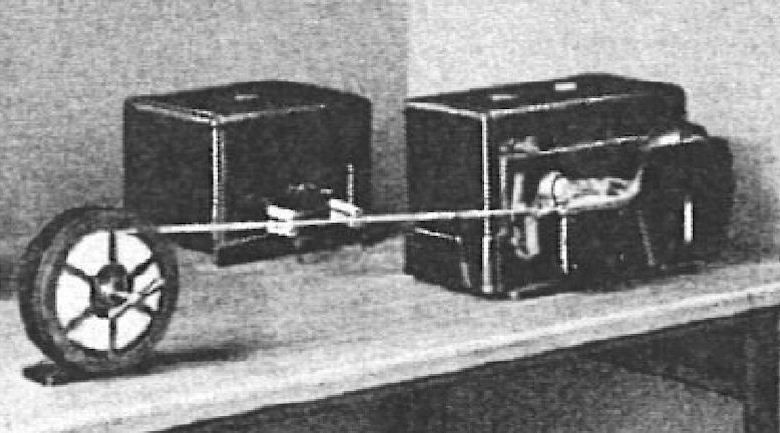 The unit measured 16x25x22 cm (WxDXH, ≈6.3x10x8.7 inch) and weighed about 3 kg (≈6.6 lbs). 1942 Luftwaffe manuals also mention a Hell Streifenzieher (lit. "tape puller"): model "Sz 2" (ref. 21, 22). 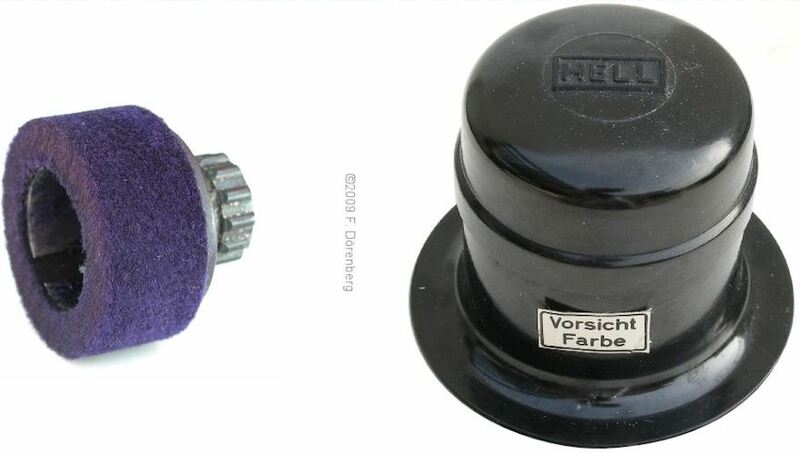 The felt ink-roller of the Hellschreiber printers must be re-inked on a regular basis. Doing this by hand is rather messy: the felt ring has to be turned while ink is applied straight from the bottle, or with a pipette, and is spread out over the width of the ring. 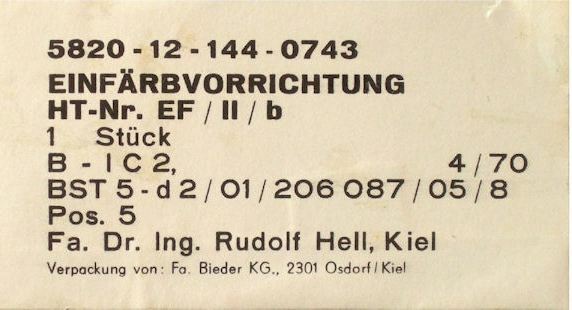 Many years after introduction of the Hellschreiber, the Hell company developed and marketed a re-inking device ("Einfärbvorrichtung"). I have one of these gadgets, brand new, and it was manufactured in 1970! See ref. 30 for the instruction manual. Option B: use gummed paper tape. The gum is on the non-printed side of the tape and is water-activated. The back of the printed tape is moistened, and segments of the tape are stuck onto a paper sheet. Only very few people (that I know) enjoy licking the back of a gummed postage stamp, let alone meters of gummed paper tape, before sticking them on telegram forms. A handy little gadget is used: a tape moistener ("Streifenanfeuchtegerät"). They have been around as long as gummed "Kraft" packing tape, and look like a simple tape dispenser with water in it. Nothing new, nothing special, not an invention for tape-teleprinters - but no doubt sold at a nice "Siemens-Hell" price... Note: for several reasons, Hell recommended using oil-base ink (a colloidal solution of pigment into oil, to be precise). I.e., not water-base ink, that would disperse all over the paper tape when moistened. Ref. 2: p.7 in "Siemens-Hell-Schreiber", Fernmeldetechnik, Siemens & Halske A. G., Wernerwerk, Berlin-Siemensstadt, 2. 37. 5. T., SH6592, 1937, 7 pp. Ref. 5: "Siemens-Hell-Geräte", pp.61-77 in "Telegrafentechnik", Band 6, Teil 6 of "Der Dienst bei der Deutschen Bundespost - Leitfaden für die Ausbildung", Fritz Schiweck (ed. ), R. v. Decker's Verlag, G. Schenck, 1960, 970 pp. Ref. 8: p.7 in "Siemens-Hell-Schreiber", Fernmeldetechnik, Siemens & Halske A. G., Wernerwerk, Berlin-Siemensstadt, 2. 37. 5. T., SH6592, 1937, 7 pp. Ref. 11: "Der Siemens-Hell-Schreiber", Alexander B. Damjanovic, in "Zeitschrift für Fernmeldetechnik, Werk- und Gerätebau", Siemens & Halske A.G., Wernerwerk, Jg. 17, Nr. 12, 1936, 7 pp., SH 66554, 1. 37. 0,5 T.
Ref. 12: "Siemens-Hell-Lochstreifengeber „S“ - T send 62 a", [product brochure] Siemens-Halske A.G., Wernerwerk für Fernmeldetechnik, SH 2969, St KB 1213/1, 11531.T.Fs, 1931?, 2 pp. Ref. 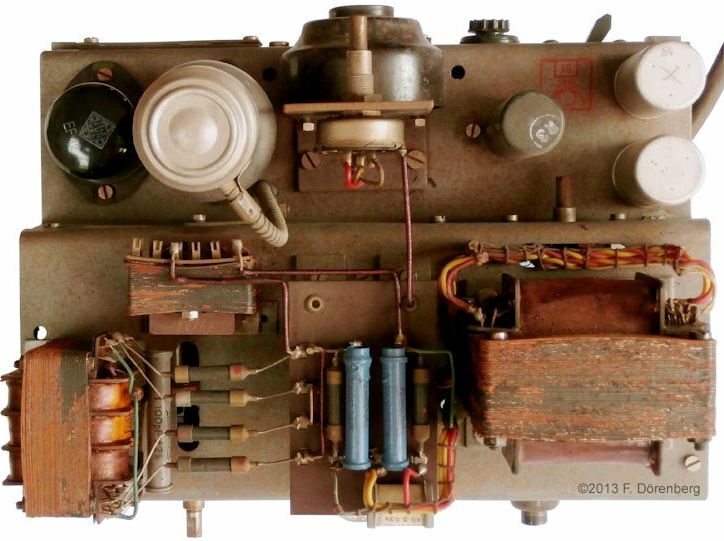 18: "RG 12 D 60 Doppelweg-Netzgleichrichter", Telefunken Datasheet G.R.B.42 D (5000), May 1940, 1 p.
Ref. 19: "Schreibverstärker SV 36 - Beschreibungs- und Bedienungsanweisung", Hell company, 1950, transcribed by H. Blumberg. Ref. 20: "Bauarten und Betriebswerte von Telegraphenapparaten für den Funkdienst" table in in "Telegrafentechnik", Band 6, Teil 6 of "Der Dienst bei der Deutschen Bundespost - Leitfaden für die Ausbildung", Fritz Schiweck (ed. ), R. v. Decker's Verlag, G. Schenck, 1960, 970 pp. Ref. 23: p. 164 in "Die Erde wird kleiner: vom Fackelzeichen zum Bildtelegramm", Johannes Sigleur, Franckh Verl., 1954, 167 pp. Ref. 24: "Die große 1,5 kW Kurzwellen-Funkstation (G 1,5 K-Station)", Provisorische Ausgabe 1944, Schweizerische Armee Technisches Reglement Nr. T 179d, 20 pp. Ref. 28: pp. 18-9, 49, 68-70, 126 in "40 Jahre dpa, Deutsche Presse-Agentur GmbH", Hans Benirschke (ed. ), Hamburg 1989, 127 pp.